The machine-made Cabernet and Merlot glass of the innovative glass collection Grape@RIEDEL is a design marvel of engineering. This glass showcases the majestically structured red wines in all their complexity and finesse. The latest machine blown technologie, in conjunction with the seamless pulled stem, offer a special design feature, which creates an indent on the bottom of the bowl, reflecting the light and adding another dimension to the lively color of wine. All RIEDEL glasses are dishwasher safe. A round, gentle egg-shaped bowls in conjunction with a pulled stem results in GRAPE, such an elegant and harmonious shape that it is a design classic. The seamless pulled stem combines a special design feature, which creates an indent on the bottom of the bowl, causing light to be reflected and adding another dimension to the lively color of wine. 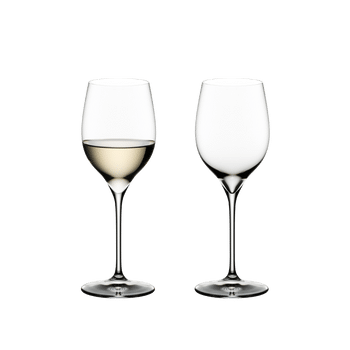 Are RIEDEL glasses are dishwasher safe? Are RIEDEL, Spiegelau and Nachtmann items made of crystal glass and lead free? All current produced items are made of crystal glass and lead free. How to care for your RIEDEL crystal? Wash under warm water, detergent is not necessary. Place on line to drain for the time begin. For extra shine, steam over boiling water. To polish use microfiber polishing cloths: Hold glass by base and polish. Use left hand to cradle the bowl and polish with your right hand. Never twist the base and bowl. To avoid scratches: Avoid contact with other glass or metal. lf available use a stemware rack. To avoid stains: Use soft water (low mineral content). To remove stains: Use white vinegar. How thin is the lip of the glass? 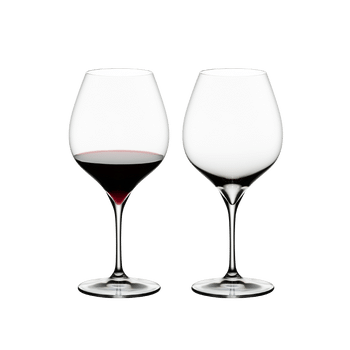 We do not have measurements to offer on each glass in regards to the thinness of the lip, but all RIEDEL glasses are beautiful thin blown crystal. Our rims are “cut”, which allows the wine to flow smoothly onto the tongue vs. being “rolled” which obstructs the smooth flow of the wine which accentuates acidity and harshness.